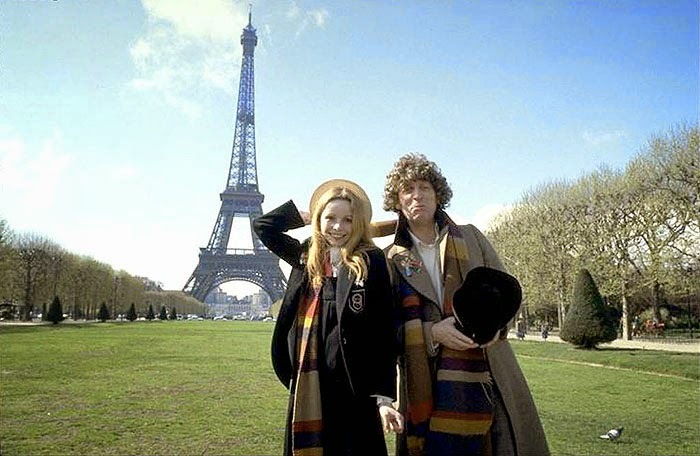 Doctor Who: Revisiting CITY OF DEATH | Warped Factor - Words in the Key of Geek. Tony Fyler may not know much about art, but he knows what he likes. When Doctor Who came back in 2005, many people asked many of the same questions. Would the sets be wobbly? No. Would the companions still be screaming girls? Not unless the situation really called for it. Would the Tardis still be a police box? Yes of course. What story from the past would be the keynote for the future? Well, City of Death, obviously. If you want to make Doctor Who into a heist movie, then this is how you do it. You set it not in a great big outer space bank, but right here on Earth in a recognisable setting, where a suave aristocratic couple are using alien technology to plan the theft of the Mona Lisa. 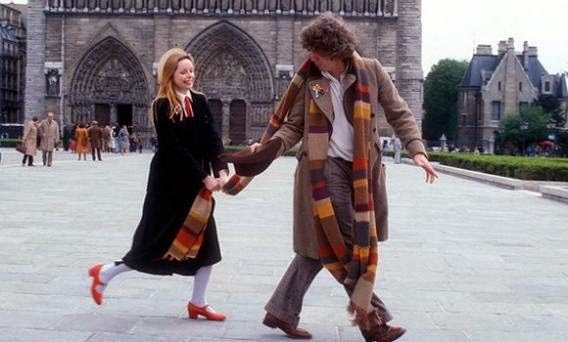 You add a Doctor and his companion at the absolute peak of their relationship: Tom Baker and Lalla Ward here banter like honeymooners, and are each a match for the dynamics of the other’s performance. And then, just when your audience thinks it’s nothing more than a jolly alien heist caper, you turn the crazy up to not just eleven, but thirteen. 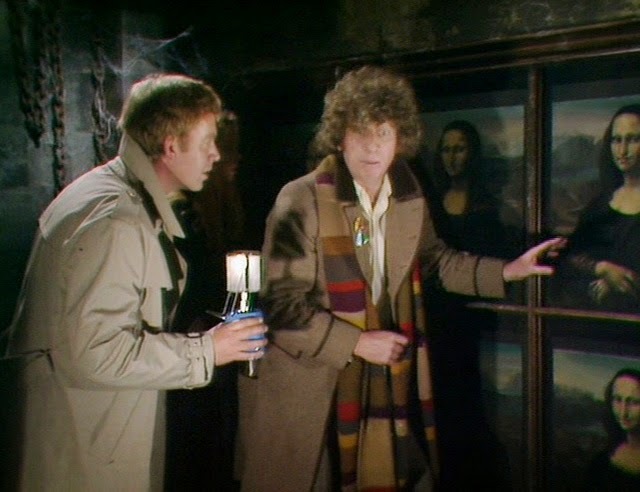 Despite the time-slip, the Doctor decides they’re on holiday, and they go to view the Mona Lisa. After another time-slip, the Doctor falls into the lap of a beautiful woman (probably), the Countess Scarlioni, and attracts the attention of English thumper-of-things and alleged detective, Duggan. And so the knockabout fun really begins. The Doctor steals the Countess’s alien tech – a bracelet that scans the defences they will need to overcome to steal the Mona Lisa – meaning Duggan gets interested in what he thinks is the Doctor’s ruse. The Countess’s husband, Count Scarlioni, sends a squad of rent-a-goons to get the bracelet back, and locks our heroes in the cellar. 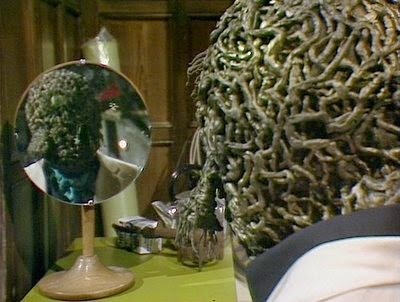 Episode 1 ends with the Count, alone, staring into the mirror and then, for apparently no reason at all, tearing his own face off to reveal Old Seaweed-Features himself – Scaroth of the Exploding Spaceship. While a great cliffhanger, it does rather boggle the mind. Not only does it mean that an alien wants to steal the Mona Lisa; it seems to mean that an alien we’ve seen blown to smithereens…wants to steal the Mona Lisa. Meanwhile, in the cellar, the time experiments make solid progress – time expert Theodore Nikolai Kerensky is busy turning eggs into chickens and back again (Well, everyone needs a hobby). So – alien art heist by exploded seaweed-faced monsters in the drawing room, world food shortage-beating time experiments in the cellar. Everyone clear? It’s like Upstairs, Downstairs written at a sci-fi convention, by people with access to way too much wine. What’s missing from all this? How about a secret chamber that’s been bricked up for centuries? No problem - Romana spots a size difference in the downstairs rooms, and boom, there’s a secret chamber that’s been bricked up for centuries. Mona Lisas. Six Mona Lisas. So – just in case you’re falling behind, a seaweed-faced alien who exploded in scene one has a bricked-up cellar chamber with six Mona Lisas in it, and is using alien tech to help him steal a seventh – the one in the Louvre. Enter Duggan with a handy bit of exposition, and a chunk of plot that could have been lifted directly from a Sherlock Holmes story – there are seven criminal art collectors around the world, each of whom would pay a kingpin’s ransom to have the Mona Lisa in their private collection…but only if they believed it was the one and only – the one hanging in the Louvre. So, that explains why the Count needs to steal the painting. What it doesn’t explain is how he ends up with six in the cellar, all of which, according to the Doctor, are genuine – or, come to that, how he knows they’ll be there so he needs to steal the seventh. A quick hop back in time for the Doctor to write “This Is A Fake” on the six Mona Lisa canvases in felt tip and the art heist plot is foiled. But no matter – because the Count has persuaded Romana to help him. Kerensky’s experiment created a separate time field, but no-one could move from one universe to the other without a field interface stabiliser. Romana obligingly builds him one, only to belatedly realise what Scaroth’s actual plan is. He doesn’t just want to unite himself into one fully-functional Jagaroth again. He wants to go back in time and stop himself pressing the button that triggered the explosion in the first place. All very fine and noble, except the explosion is what started the development of life on the planet, so if he succeeds, we’re all doomed never to have existed. What you need in situations like this of course, is a handy detective who likes to thump things. Duggan travels back to primordial Earth with the Time Lords, lamps the lantern-jawed Jagaroth and saves the course of history as we know it. Good old Thumper Duggan. 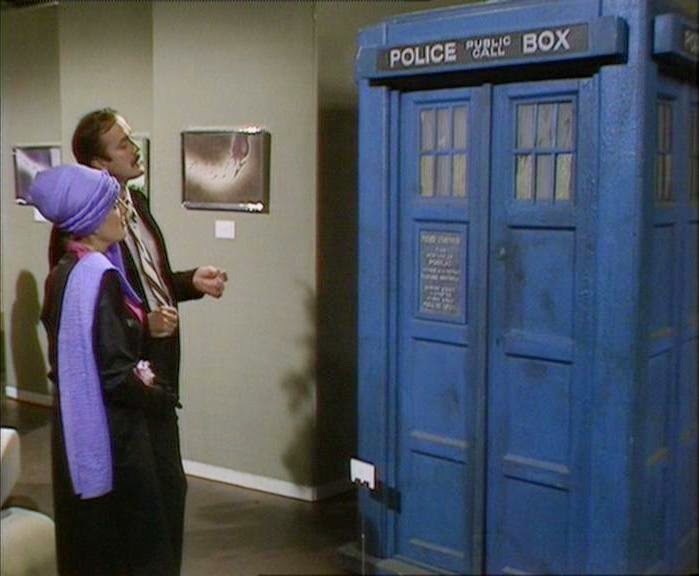 And so, bar a timeless cameo from John Cleese and Eleanor Bron, finally answering the question “The Tardis – fantastic dimensionally transcendental time machine, yes, but is it art?”, we leave the City of Death behind. But given it actually makes staggeringly little sense, why has it so often been cited as the story with the tone that re-launched Doctor Who to greater triumphs in the New Who era? Because if you look at it really hard, you see the fundamental components for a successful 21st century show. The Doctor and his companion are equals here in a way they had seldom been in the Classic show. Scaroth, played by classically-trained stage actor Julian Glover, for the most part mixes charm, nous and a worldly humour with a fundamental brutality that quite takes the breath away. The scale of the show feels bigger and better than the endless gravel-quarries of the majority of 70s Who, and the performances, the dialogue, and the deliciously bonkers plot all match the effervescence of the location. The dialogue makes the mad world of the plot feel populated with real people. And City of Death has a firm, firm grip on its tone from start to finish. In this, more than in anything else, it maps out the 21st century future of the show – in a world before tone meetings, City of Death showed the way.